Just the thing for adding textural layers to beats, basslines, FX and more - and it’ll be even better when it can import samples. Excellent library of onboard sounds. Pitch tracking would be very helpful. The debut release from industry veterans Jim Credland and Dom Smart is a plugin effect that analyses the dynamic envelope of the input and uses it as the amplitude control signal for the playback of a sample-based source sound from its onboard library. Feed Texture a drum loop, for example, and you can set the envelope follower up to add a noise layer to just the loudest hits, or dynamically responsive crowd noise, vinyl crackle or sampled reverb to the whole signal. Or perhaps run a bassline in for bolstering with all sorts of synthesised waveforms and tones - you get the idea. Texture’s interface puts sound selection and tweaking on the left, filtering and envelope controls along the bottom, levels and mix balance on the right, and everything else in the main four-tab window at the centre. Clicking the sound source selector pops up a categorised menu of over 340 ‘regular’ and granularised sampled sounds - see Texture messages. Selecting one loads it into the plugin, complete with a visual representation of its waveform, a brief description, and between one and three adjustable parameters. For almost all sources, the first of these will be Pitch, enabling up to two octaves of pitchshifting up or down. Beyond that, you’ll often get the tone-shaping Colour control, and, less often, the thickening Density knob. The Sine Oscillator source, uniquely, features an Octave control, for up to five octaves of range. The level threshold that the input signal has to exceed to trigger the source sound is set using the Gate knob or the Gate handle in the Dynamics tab of the main window. The Attack, Hold and Decay knobs shape the envelope response time, ranging from 0.1ms-1s, 1ms-4s and 1ms-10s respectively; and lowering the Limit handle or knob ‘compresses’ the envelope, setting a volume ceiling above which it can’t rise. All of this is clearly visualised in the main display, which shows the input waveform in grey and the triggering envelope as a blue outline. 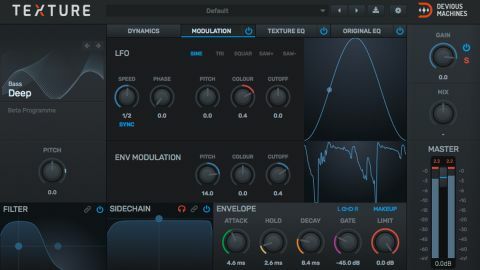 By default, the envelope responds only to amplitude, but the Sidechain Filter can be activated to narrow the response down to a particular frequency range - handy for targeting, say, the snare in a drum loop. Alongside that, a band-pass filter is on hand for broad frequency shaping of the source sound. The Modulation tab houses a syncable (or free- running at 0.01ms-4s), phase adjustable LFO, which is independently assigned to the Pitch and Colour (if present) source parameters, and filter cutoff. The envelope can also be brought to bear on the same three targets, but while that’s certainly useful, the inclusion of a separate modulation envelope would be even more so. Separate frequency shaping of the source and input signals is done in the Texture EQ and Original EQ tabs. Each comprises a five-band fully parametric EQ, with every band switchable between eight filter types (peak, notch, shelving, etc) and adjusted directly within the display - although this doesn’t feature a spectrogram. With its simple fundamental proposition, tidy workflow and thoughtfully constructed internal library, Texture is a versatile and useful sound design tool. It’s particularly effective at adding energy and fizz to drums, percussion, FX (risers, impacts, etc) and anything else with a pronounced or character-defining envelope. There are also plenty of reverberations and ambiences in the library, which are good for adding air to snares and claps. And by setting the mix 100% wet, it even makes for a capable drum replacer, although the library doesn’t currently contain any sampled kicks or snares. Sadly, it ain’t happening just yet, although we’re told that it’s due to be added in a forthcoming point update. The onboard sounds are diverse and cleverly compiled, but the ability to freely add to them, particularly for drum replacement and experimentation, will be huge. It could be argued that both of those functions are really beyond the plugin’s remit, but we’re all for having that remit expanded. Hopefully a few onboard effects will find their way into the architecture at some point, too. Texture’s onboard sound library comprises over 340 sampled and granular sources (the latter indicated by the presence of the Density and/or Colour controls), and is carved up into a menu of grouped categories. The instrumental categories take in the likes of Bass, Cymbals, Percussion, Synth Tones, Orchestral and Vocal, and contain everything from pads, analogue leads and orchestral chords to shakers, ride cymbals, synth basses, drones and human voice treatments. The various SFX categories are home to a rich assortment of foley sounds (‘Paper Crumple’, ‘Ice Cracking’, ‘Leaves Crunching’, etc), as well as Mechanical (‘Grinding Gears’, ‘Hand Drier’, etc), Water (‘Heavy Bubbles’, ‘Water Filling Basin’, etc), Crowd and Ambience (‘Cave’, ‘Beach’, ‘Distant Sea’, ‘Traffic & Birds’, etc) noises. The Vinyl category hosts eight styles of record sounds, from ‘78 End Loop’ to various weights of ‘Crackle’, while Reverberations is home to an entertaining roster of drum-sourced reverb tails, and Electrical serves up mains hum, tape noise and so on. While the focus of the library is on noise and... well, texture, the more overtly musical sounds are great, too, whether pitch-automated or used as the basis for non-melodic layers. As it stands, then, Texture is a neat, cleverly conceived plugin that does a brilliant job of instantly enhancing or altering drums and percussion, ingraining musical and non-musical sounds with shaped or pulsatile ambience, noise and colouration, and adding synthesised low-end weight to weedy tones. The source sounds cover a broad range of acoustic, electronic and environmental bases, and the straightforward controls and modulation setup keep the workflow quick and intuitive. We eagerly look forward to importing our own samples and are crossing our fingers for pitch tracking, but don’t let the current absence of either be the thing that holds you back from getting involved with this unique and powerful plugin right now.